Diesel-powered generator sets (commonly known as gensets) are a crucial element in refrigerated cargo transport, with an estimated 40,000 units in service worldwide providing power and cold chain integrity for refrigerated container operations. Historically, the main method to monitor gensets and capture data has been manual, and this is still common today. Shipping line employees, container terminal clerks and inspectors from third-party monitoring companies walk in front of the genset and manually check the fuel level and operating status. This is time-consuming and expensive. With advancements in cellular, GPS, machine-to-machine (M2M) and Internet of Things (IoT) technologies, it is estimated that 30% of these units are now fitted with telemetry-based remote genset monitoring systems. But in an industry so driven by cost control, how do you build the ROI case for genset monitoring? 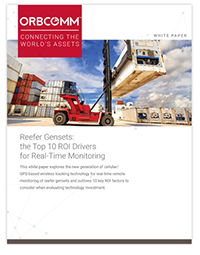 This white paper explores the new generation of cellular/GPS-based wireless tracking technology for real-time remote monitoring of reefer gensets and outlines 10 key ROI factors to consider when evaluating technology investment. Real-time visibility and control, leveraging the latest M2M and IoT technologies, is emerging as the norm across the cold chain, becoming a basic requirement for remaining competitive in business. Don’t get left behind! Get started by downloading your free white paper today.